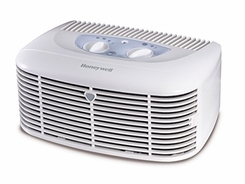 The Honeywell Pet CleanAir™ Air Purifier helps capture pet allergens in your room. Its HEPA-type filter helps capture up to 95% of pet dander and other airborne allergies from the air that passes through the filter. This air purifier also helps reduce pet odors and traps pet fur with an activated carbon pre-filter. The HHT-013 is compact and fits perfectly on any table, counter top or nightstand. Great for small rooms or pet areas. Helps capture up to 95% of pet dander from the air that passes through the filter. Electronic filter indicator lets you know when the filter needs to be replaced. Compact design that can sit vertically or horizontally.